The amphitheatres were the arenas where the gladiator battles took place, specifically created for this purpose, they were also the perfect sports arenas of their time. Grand, bold and the equivalent of the Roman sports stadiums of today the amphitheatre’s grew in size and scale mostly due to the demand for the gladiator games. In the early days of gladiator contests, they would be held in small public areas, somewhere like a market place or maybe a farm or a side street near to the centre of town. It was common for these places to have makeshift seating arranged for tickets to be sold, or guests and friends to be invited to watch the battles. As popularity grew for this form of entertainment combat, the size and scale of these events grew also. 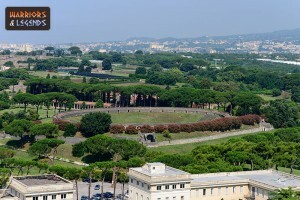 This eventually reached the point where demand was so great for the gladiator games that custom amphitheatres were planned to meet the growth of love for this sport in Rome. The first custom built amphitheatres were thought to have been built using wooden seating, using the traditional elevated design that allowed easy viewing of the action from any area. Even at this first design stage, the oval amphitheatres had the main stage area covered in sand. These essentially mobile amphitheatres were purported to have been easy to construct and were thought to have been dotted all around Rome. As the designs and scale grew, the next level of amphitheatres started to be constructed from Stone making them a more permanent fixture in Roman life. The first of these permanent amphitheatres was built in 30 BC, under the tenure of Augustus, but the first stone permanent amphitheatre was constructed during the 1st century BC in Pompeii. So the growth of this bloodthirsty sport was part of the reason for the amphitheatres in Roman times, and of course this culminated to the point of the most famous amphitheatre of all time, the Roman Colosseum. 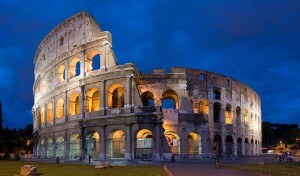 The grandest of the grand amphitheatres the Colosseum of Rome. The grandest of the grand amphitheatres, the Colosseum of Rome was a marvel to behold once completed and to this day still remains a true spectacle. Work began on this ambitious project in 72 CE under the guidance of Emperor Vespasian who was keen to make a mark in the Roman public eye. His grand scheme was to build a giant entertainment centre piece to unite the public in his favour and the Colosseum was that centre piece. 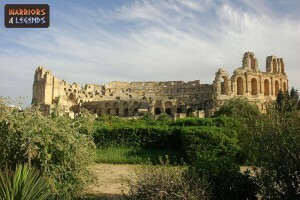 The amphitheatre of El Djem situated in Tunisia. The 2nd or 3rd largest known Roman amphitheatre in the world, depending on how you look at it, is that of El Djem located in what is now Tunisia. At the time of its construction, this amphitheatre would have been location in the Roman town of Thysdrus. Famous as being involved in the filming of the Hollywood movie ‘Gladiator’, this amphitheatre is still in good condition, despite some of the stones from this theatre being used in the 17th century by locals to build houses. This amphitheatre is still quite the spectacle to behold and would in its prime have the ability to house around 35,000 people, all hungry to see the gladiators fight for glory and fame. The Verona Arena situated in Italy. This still impressive Roman amphitheatre is one of the largest with a capacity of around 30,000, and is situated in Verona, Italy. The Verona Arena is even still in use today, and we believe it has been used all throughout history for many purposes. In Roman times of course, the gladiators would have battled here, in medieval times its purpose would have been similar but jousting tournaments and entertainment would have been the order of the day. Even now the Verona Arena is still in use for musical concerts including large outdoor opera events. The Pula Arena situated in Croatia. Situated in Pula, in what is now Croatia, this amphitheatre is one of the best preserved in the world and was built around 1 AD. Able to house up to 26,000 people the Pula Arena has suffered like many other amphitheatres from stones being taken to build nearby houses. However, this practise has now stopped and this amphitheatre is still used by the Croatian people to put on all manner of festivals and events throughout the year. The Pompeii Spectacula built around 80 BC. Built around 80 BC this Roman amphitheatre was well preserved when mount Vesuvius erupted in August 79AD and covered it and the surrounding areas in vast amount of ash, earth and soil. The name of this amphitheatre the Pompeii Spectacula actually originates from the fact that this is the oldest surviving amphitheatre and when it was built this word was not commonly used. Despite being one of the oldest, its still very large, with the ability to house around 20,000 people. Thought to be almost the entire population of Pompeii at the time. The Amphitheatre of Nimes situated in France. 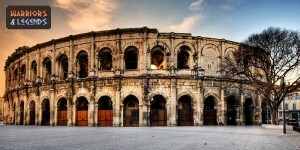 The Amphitheatre of Nimes is situated in Nimes in what is now France, but at the time would have been known as Gaul. This amphitheatre was built at a similar time to the Pula Arena around 1 AD and was at the time able to seat a capacity of around 24,000 people. This amphitheatre after the fall of Rome has had many uses, including being used as a fortification in medieval times, and even used as a dwelling for many families and people, who lived their daily lives within this massive structure. However in modern times, this arena is now in use as a public arena and even houses yearly bullfights from the region. With so many great and diverse amphitheatres built around the Roman empire, it becomes quite clear how important these structures were. With the oldest surviving amphitheatre in Pompeii, we can see how over time, there structures stayed true to their origins but also grew in size and scale. With the final amphitheatre, the Colosseum of Rome, these structures would have in their day been amazing buildings to witness in person. Even today in their tarnished states they are still some of the most impressive sporting arenas ever to have been created.